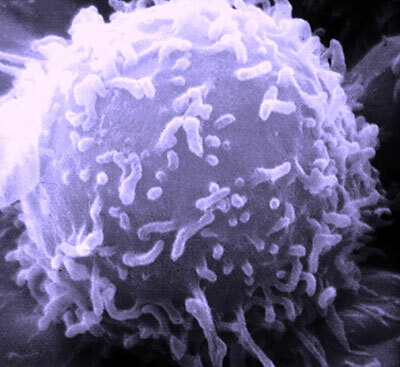 A single human lymphocyte, a white blood cell that acts as part of the immune system. Intraepithelial lymphocytes, which specialize in patrolling intestinal walls, can cause human Crohn's disease. Immune systems have their sinister side, especially when they have not learned how hard to fight. Crohn’s disease and other inflammatory bowel diseases inflict more than a million Americans with debilitating pain and digestive unrest because of uncontrolled immune responses in the gut. How this happens remained a mystery until immunologists at Cornell’s College of Veterinary Medicine caught a key culprit in Crohn’s disease: a cell from our own immune forces. With unconventional help from a common parasite, Eric Denkers, professor of immunology, and research associate Charlotte Egan identified a renegade cell responsible for this largely arcane and increasingly prevalent illness. Similar symptoms arise when some hosts first face the prevalent protozoan Toxoplasma gondii. Denkers’ lab studies this parasite’s arsenal of host-manipulating powers, but recently they have steered Toxoplasma research in an entirely new direction. Intestinal wall after Toxoplasma infection and inflammation, compared to undamaged intestinal wall. Denkers and colleagues published their discovery in Mucosal Immunology, followed by a review article discussing Toxoplasma infection as a model for Crohn’s disease in the Journal of Biomedicine and Biotechnology in 2010. Graduation rarely means the end of education, especially in the medical world. A veterinary degree opens doors to countless further training opportunities. The College of Veterinary Medicine and the AHDC offer residency programs that let DVMs delve into in the cellular side of disease. 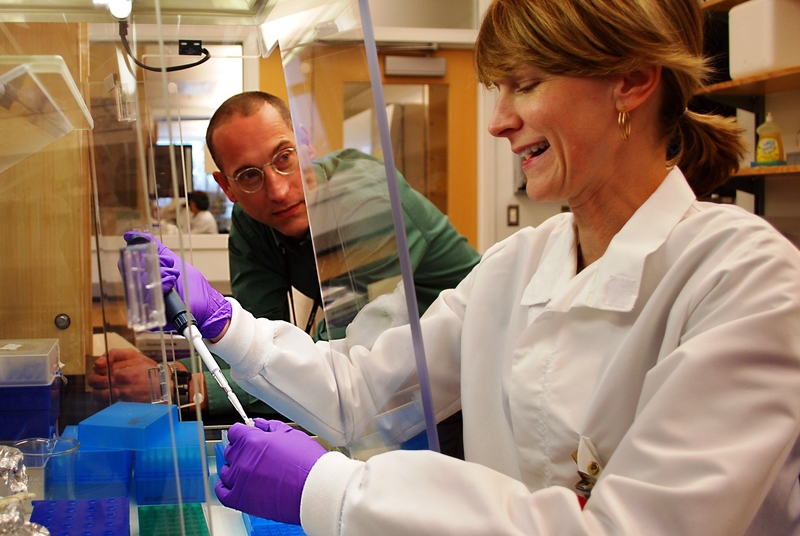 In the residencies for Diagnostic Sciences and Clinical Pathology, veterinarians wanting to gain more experience in diagnostics come to Cornell to practice for three years under the mentorship of seasoned specialists before testing to become board-certified specialists themselves. Wonhee Cha pioneers the nation’s first veterinary residency program in diagnostic sciences here at the AHDC. With a collection of experience in international clinical service and epidemiology research under her belt, she is honing her diagnostic tools in preparation for a future foray facing infectious diseases of the third world. When the service period ended, Cha went on to pursue her burgeoning interest in epidemiology at the laboratory of infectious diseases and molecular biology at Ohio State University, where she earned her master’s degree. So Cha came to the College of Veterinary Medicine in 2008 to learn the diagnostic tools she needed, and to apply them to hands-on disease research at the College’s integrated hospital and diagnostic lab. As the solitary inaugural resident in the country’s first diagnostic sciences residency program, Cha is paving the way for the future of the field. While other diagnostic residencies focus on a single area from the start, residents in this program spend the first year rotating through each of the AHDC’s thirteen sections, gaining an understanding of each diagnostic area and a comprehensive look at the field as a whole. 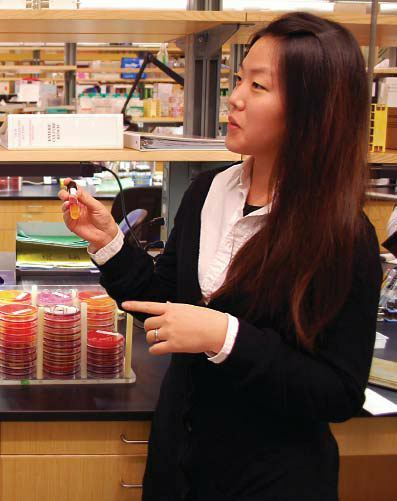 In her first year Cha spent time in each section, including anatomical pathology, avian disease, bacteriology, clinical pathology, comparative coagulation, serology and immunology, endocrinology, molecular diagnostics, parasitology, quality milk production services, toxicology, virology, and veterinary support services. In her third and final year, Cha continues her work in bacteriology, hoping to finish her PhD before setting out to pursue her dream of addressing infectious diseases of animals in developing countries. Sometimes you can look at an animal and know what’s wrong, but many mysteries of disease lurk far beneath the surface, in the cells themselves. Clinical pathology residents Drs. 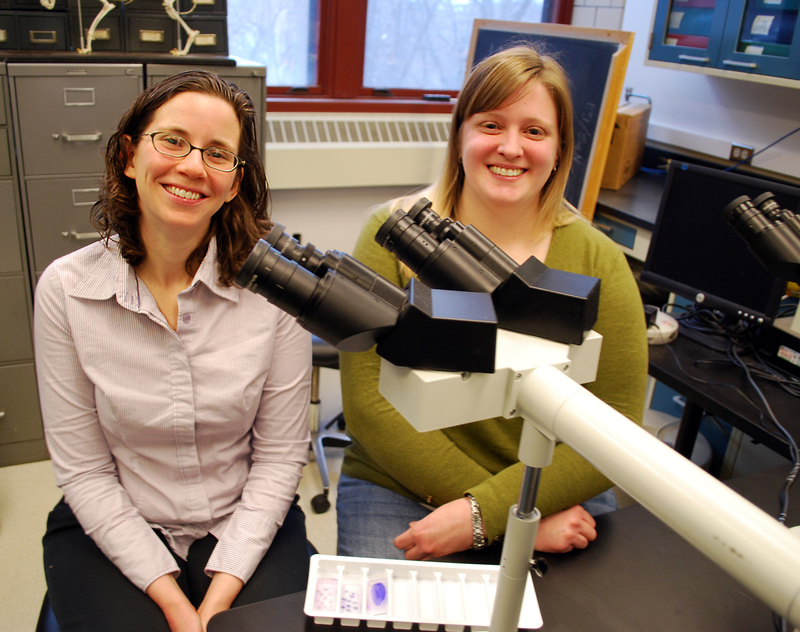 Nora Springer and Erika Gruber ’06 are scientific sleuths who traded magnifying glasses for microscopes, investigating samples on the biochemical and cellular levels to study and diagnose disease. Clues can come from all kinds of cells, and part of a clinical pathologist’s job is to recognize what is normal and what is not from each sort of sample. When a sample comes in, the clinical pathology residents provide the front line of investigation. After inspecting, describing, and forming a diagnosis, they consult with the lab’s board-certified pathologists, Drs. Tracy Stokol, Heather Priest, and Deanna Schaefer, who look over the report and discuss it with the residents. Unlike most pathology programs, the discussion doesn’t stop there. Cornell’s program encourages collaboration, and all five staff dedicated to clinical pathology pool their perspectives three times a week. “You gain a lot by hearing different opinions from people trained in different environments,” says Stokol, one of the three clinical pathologists who supervise the program. “Our residents must do a rotation in anatomic pathology, and can also choose to rotate through other specialties, including oncology, toxicology, and large or small animal medicine. That’s been very helpful for them.”Clinical pathology residents divide time between clinical service and research, exposing them to both sides of the field. At the end of their three years of service, Gruber and Springer will apply their knowledge in a three-day examination for board certification in clinical pathology. Several career paths branch out for a newly ordained clinical pathologist. Some go on in academia, pursuing PhDs and becoming tenure-track research professors or joining a clinical track emphasizing teaching and service. Others go into diagnostic practice in labs like the AHDC, or into private industry, particularly in the field of pharmaceuticals. The government offers further jobs for trained clinical pathologists. Organisms from all corners of the animal world arrive at the doors of the New York State Veterinary Diagnostic Laboratory and Animal Health Diagnostic Center (AHDC). Foreign or familiar, prevalent or peculiar, pathogens must reveal their true identities before veterinarians can begin to make sense of samples, diagnose diseases, and develop treatment plans. How do you identify a microscopic organism? The traditional method has guided doctors and scientists through the past 100 years. Smear a sample on an agar plate, a petri dish covered with gelatin made from seaweed, and study the culture as it grows. What shape does it take? Does it move or stay still? What is its biochemical profile? What food does it prefer? Scientists use these kinds of questions to match mystery organisms to those successfully identified in the past. But sometimes matching lists of characteristics isn’t enough. “We deal with some oddball organisms,” says Dr. Craig Altier, a microbiologist with big aspirations for the future of identifying small life-forms. While traditional methods of identification can reliably distinguish common or easily differentiated organisms, they shed less light on outliers, including newly mutated species, rare breeds of bacteria, and fraudulent fungi. Every individual has a unique DNA fingerprint, and so does every species. Evolution shakes the genetic dice many times over, but all species have certain genes that survive unchanged for generations. Researchers have already been looking at conserved genes to map out relationships between species, and now Altier and his colleagues are adapting these techniques for veterinary medicine. The new approach uses PCR techniques to amplify DNA from selected conserved genes. Cornell’s on-campus DNA Sequencing Center decodes samples into a string of about 500 bases of A, T, C, or G, then compares them to samples in the National Center for Biotechnology Information’s genetic database to look for similarities. Comparative genetics can also expand our knowledge of a given disease. 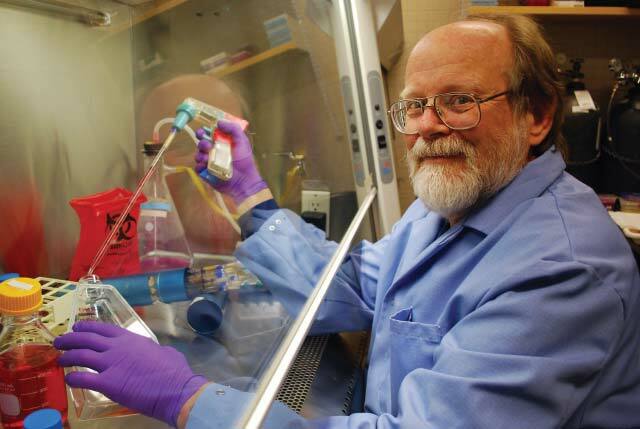 He hails from Holland, battled bacteria in Nigeria, launched labs against Marek’s disease in Mexico, and recently returned from an Australian excursion studying one of the more dangerous strains of Avian Influenza. With Cornell as his home-base since 1975, he has continued collaborations with researchers around the world. Best known for his industry-changing work improving poultry health for which he recently received a lifetime achievement award, Schat attributes the inspiration and success of his career to his early experiences abroad. In Mexico, Schat met Dr. Bruce Calnek, an avian pathology professor from Cornell who shared Schat’s growing interest in Marek’s disease. Calnek invited Schat to work in his lab as a graduate student, and Schat has worked at Cornell ever since. While pursuing his PhD, Schat isolated the SB-1 strain of Marek’s disease in chickens and used it to develop a vital vaccine still used on the market today. The vaccine generated significant royalties for the College, and continues to generate income. Most of that money went back to the former Department of Avian and Aquatic Animal Medicine, pooling with other departmental money to support grad students and research expenses. When the department later merged into the Department of Microbiology and Immunology and the flock of avian medicine students pursuing PhDs thinned, the money lay dormant for many years. “Dr. Calnek was in charge of the former department’s funds. When he retired in 1996 I was charged with overseeing their use,” Schat explains. The Expanding Horizons program seemed like the perfect choice for Schat, who shares its core philosophy: that working in developing nations empowers students to improve themselves and their world. Expanding Horizons provides Cornell veterinary students with grants to spend 6-10 weeks in a developing nation engaged in a hands-on veterinary experience or research project. Projects span the veterinary spectrum, from rehabilitating wildlife or teaching farmers vaccination techniques, to researching rhino parasites or promoting habitat conservation. Students have traveled to all corners of the world, including Kenya, Madagascar, Honduras, Bolivia, Italy, Vietnam, Thailand, Taiwan, and many more. Should you have an interest in contributing to this fund, please contact Amy Robinson in the Alumni Affairs and Development Office at amy.robinson@cornell.edu or 607.253.3742. “Blood is the window to the body,” says Dr. Tracy Stokol, a professor with a passion for pathology puzzles. Microscopic magnification opens that window, revealing a cellular world which veterinarians explore in the quest to analyze disease. Clinical pathologists like Stokol navigate that world as diagnostic detectives, using cellular samples from body tissue and fluids to piece together a patient’s story. If an animal has a bodily bump, how do you tell if it’s a bruise or inflammation, a fatty tumor or malignant cancer? Veterinarians use needles to take samples for examination. Clinical pathologists use these cellular clues to solve medical mysteries. 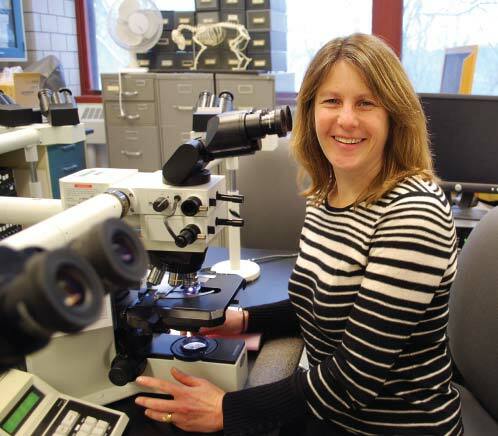 Stokol has taught the visual language of cellular samples at the College of Veterinary Medicine since 1993, and is now an associate professor in the Department of Population Medicine and Diagnostic Sciences. A skilled specialist, Stokol attributes her passion for clinical pathology to the fun of solving a mystery. Stokol’s story started in Melbourne, Australia, where she earned her veterinary degree in 1987, worked for two years as an assistant veterinarian, and earned a PhD before coming to Cornell. She belongs to several societies for clinical pathology, chemistry, and diagnostics, and has published several book chapters and over 50 papers in peer-reviewed journals, reflecting her dedication to furthering research in her field. That’s why Stokol and her colleagues require that the College’s clinical pathology residents complete a research project. 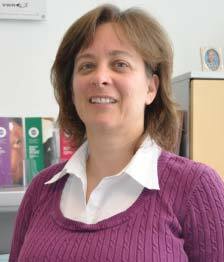 As an academic clinician, Stokol furthers her passion through her teaching. Together with fellow clinical pathologists Dr. Heather Priest and Dr. Diana Schaefer, Stokol supervises the College’s residency program in clinical pathology. Specialists in this field need thorough training to learn to successfully sort out the secrets cells can tell. But for Stokol and her peers, the challenge is worth it. Herds of grazing cattle set the classic backdrop of any drive through the Empire State. New York means cows, and not just because of the scenery. Dairy farms feed millions, providing the number one agricultural industry in the state, which ranks third in the US for milk production. The economy, natural resources, and public health of the state depend on healthy cattle. For that reason, New York State has developed a program to ensure the health, productivity, and stewardship of cattle and the farms they inhabit. The New York State Cattle Health Assurance Program (NYSCHAP) provides a free service to any interested dairy or beef farm in the region. Funded through the state’s Department of Agriculture and Markets, the program offers collaborative consultations with state or certified veterinarians specially trained to work with farmers and their herd veterinarians to increase herd health, productivity, and profitability. NYSCHAP works to assure food safety, public health, and consumer confidence in beef and dairy products that are sold in markets across the state and deck countless family tables. The program also supports the region’s natural resources by promoting environmental stewardship and best practices for waste management. A NYSCHAP farm team consists of a state field veterinarian or certified NYSCHAP veterinarian, the farm’s owner, the herd’s veterinarian, key farm employees, and other consultants used on the farm. After reviewing basic information and conducting a walk-through risk-assessment, the team forms a herd plan, including a prioritized list of best management practices specifically tailored to the farm. Extension veterinarians from the College’s Diagnostic Lab helped get the program off the ground in 1998. Today faculty from the AHDC continue to assist in the program’s development and implementation, train veterinarians on pertinent topics, and meet herd veterinarians to discuss the use of new testing capabilities as these new tests become available. 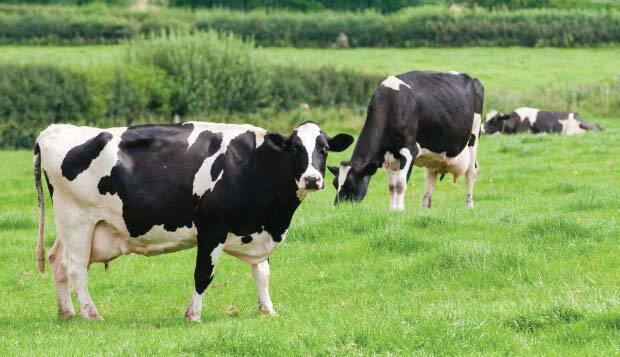 Participating farms receive significant discounts on certain tests at the AHDC, including Johne’s disease testing and bulk tank culture testing for contagious mastitis, an infection of the udder. All farms enroll in the core module, which addresses biosecurity, food quality assurance, environmental stewardship, management of manure, feed, water, and facilities, and the possible introduction and spread of disease. Farms may also enroll in individual modules tailored to specific diseases, including Johne’s disease, bovine viral diarrhea (BVD), salmonella, bovine leukosis, mastisis and milk quality, and environmental pathogens. Other modules specifically address beef quality, herd expansion, and cattle welfare certification. Currently 870 farms throughout New York State participate, including 60-70 beef farms, and 35% of all dairy cattle farms in the state. Farmers interested in enrolling in NYSCHAP can contact their herd veterinarians, or go online for more information at http://nyschap.vet.cornell.edu/. NYSCHAP utilizes 11 NYS Department of Agriculture and Markets field veterinarians, and offers a training program for private practitioners. Veterinarians interested in becoming certified complete a training class or submit a certification test. Contact Kathy Finnerty, NYSCHAP Coordinator, at kdf2@cornell.edu for more information.